Mazar-i-Sharif (Dari/Pashto: مزار شریف‎; Mazâre Šarif; [ˌmæˈzɒːr ˌi ʃæˈriːf]) is the second-largest city of Afghanistan, with a 2015 UN—Habitat population estimate between 577,500 and 693,000. It is the capital of Balkh province and is linked by highways with Kunduz in the east, Kabul in the southeast, Herat in the west and Uzbekistan in the north. Mazar-i-Sharif, along with Herat, Jalalabad in the east and Kandahar in the south, makes Afghanistan an important strategic location in Asia. The city also serves as one of the many tourist attractions because of its famous shrines as well as the Muslim and Hellenistic archeological sites. In 2006, the discovery of new Hellenistic remains was announced. 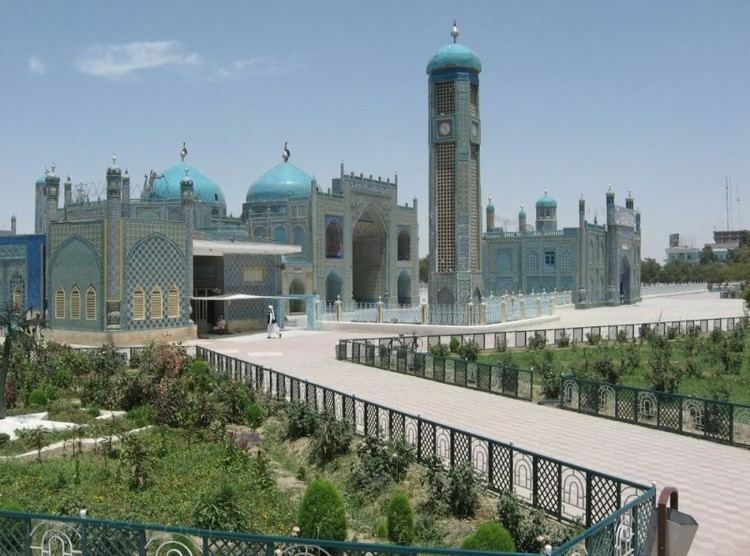 Mazar-i-Sharif is the Regional Hub located in the northern region in close proximity to Uzbekistan and Tajikistan. Mazar-i-Sharif has the highest percentage of built-up land (91%) of all the Afghani provincial capitals, and it has additional built-up area extending beyond the municipal boundary but forming a part of the larger urban area. The region around Mazar-i-Sharif has been historically part of Greater Khorasan and was controlled by the Tahirids followed by the Saffarids, Samanids, Ghaznavids, Ghurids, Ilkhanates, Timurids, and Khanate of Bukhara until the mid-18th century when it became part of the Durrani Empire after a friendship treaty was signed between emirs Murad Beg and Ahmad Shah Durrani. The Mazar-i-Sharif International Airport in the city has been heavily used during the 1980s Soviet war and the latest 2001-present war. The city along with the region south of the Amu Darya became part of the Durrani Empire in around 1750 after a treaty of friendship was reached between Mohammad Murad Beg and Ahmad Shah Durrani, the founding father of Afghanistan. In the late 1870s, Emir Sher Ali Khan ruled the area from his Tashkurgan Palace in Mazar-i Sharif. This northern part of Afghanistan was un-visited by the British-led Indian forces during the Anglo-Afghan wars of the 19th century. Mazar-i-Sharif remained peaceful for the next hundred years until 1979, when the Musahiban dynasty was left powerless due to the planned murder of Sardar Doud Khan, and the neighboring Soviet Union invaded Afghanistan. During the 1980s Soviet war, Mazar-i-Sharif was a strategic base for the Soviet Army as they used its airport to launch air strikes on Afghan mujahideen. After the Soviet withdrawal from Afghanistan in 1989, control of Mazar-i-Sharif was often contested between the Hazara militia Hezbe Wahdat, led by warlord Hajji Mohammed Mohaqiq, the Tajik militia Jamiat-e Islami, led by Ahmad Shah Massoud and Burhanuddin Rabbani, and the Uzbek militia Jumbesh-e Melli led by warlord Abdul Rashid Dostum. As a garrison for the Soviet-backed Afghan army, the city was under the command of Dostum, who mutinied against Najibullah's government in 1992. Under Dostum's 5 year rule from the early 1990s to early 1997, the city was relatively peaceful. The rest of the nation disintegrated and was slowly taken over by the Taliban forces, Dostum strengthened political ties with the newly independent Uzbekistan as well as Turkey. He printed his own currency and established his own airline. This peace was shattered in May 1997, when he was betrayed by one of his generals, warlord Abdul Malik Pahlawan, forcing him to flee from Mazar-i-Sharif as the Taliban were getting ready to take the city. It is reported that between May and July 1997 Abdul Malik Pahlawan executed thousands of Taliban members, that he personally did many of the killings by slaughtering the prisoners as a revenge for the 1995 death of Abdul Ali Mazari. "He is widely believed to have been responsible for the brutal massacre of up to 3,000 Taliban prisoners after inviting them into Mazar-i-Sharif." Several of the Taliban escaped the slaughtering and reported what had happened. The Taliban retaliated in 1998 attacking the city and killing an estimated 8,000. At 10 am on 8 August 1998, the Taliban entered the city and for the next two days drove their pickup trucks "up and down the narrow streets of Mazar-i-Sharif shooting to the left and right and killing everything that moved—shop owners, cart pullers, women and children shoppers and even goats and donkeys." More than 8000 noncombatants were reported killed in Mazar-i-Sharif and later in Bamiyan. In addition, the Taliban were criticized for forbidding anyone from burying the corpses for the first six days (contrary to the injunctions of Islam, which demands immediate burial) while the remains rotted in the summer heat and were eaten by dogs. The Taliban also reportedly sought out and massacred members of the Hazara, while in control of Mazar. The city slowly came under the control of the Karzai administration after 2002, which is led by President Hamid Karzai. The 209th Corps (Shaheen) of the Afghan National Army is based at Mazar-i-Sharif, which provides military assistance to northern Afghanistan. The Afghan Border Police headquarters for the Northern Zone is also located in the city. Despite all the security put in place, there are reports of Taliban activities and assassinations of tribal elders. Officials in Mazar-i-Sharif reported that between 20 and 30 Afghan tribal elders have been assassinated in Balkh Province in the last several years. There is no conclusive evidence as to who is behind it but majority of the victims are said to have been associated with the Hezb-i Islami political party. On April 1, 2011, as many as ten foreign employees working for United Nations Assistance Mission in Afghanistan (UNAMA) were killed by angry demonstrators in the city (see 2011 Mazar-i-Sharif attack). The demonstration was organized in retaliation to pastors Terry Jones and Wayne Sapp's March 21 Qur'an-burning in Florida, United States. Among the dead were five Nepalese, a Norwegian, Romanian and Swedish nationals, two of them were said to be decapitated. Terry Jones, the American pastor who was going to burn Islam's Holy Book, denied his responsibility for incitement. President Barack Obama strongly condemned both the Quran burning, calling it an act of "extreme intolerance and bigotry", and the "outrageous" attacks by protesters, referring to them as "an affront to human decency and dignity." "No religion tolerates the slaughter and beheading of innocent people, and there is no justification for such a dishonorable and deplorable act." U.S. legislators, including Senate Majority Leader Harry Reid, also condemned both the burning and the violence in reaction to it. Mazar-i-Sharif has a cold steppe climate (Köppen climate classification BSk) with hot summers and cold winters. Precipitation is low, and mostly falls between December and April. The climate in Mazar-i-Sharif is very hot during the summer with daily temperatures of over 40 °C (104 °F) from June to August. The winters are cold with temperatures falling below freezing; it may snow from November. 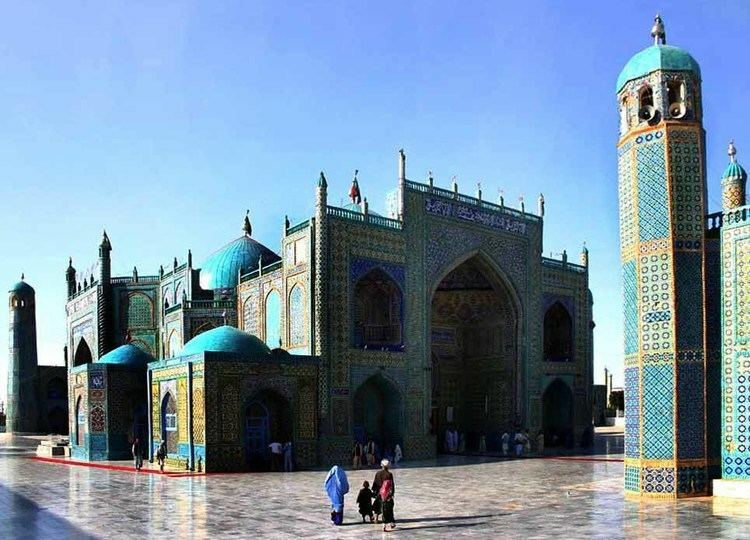 The dominant language in Mazar-i-Sharif is Dari, an eastern variety of Persian, followed by Uzbek, a Turkic language. Majority of the population of Mazar-i Sharif practice Sunni Islam. 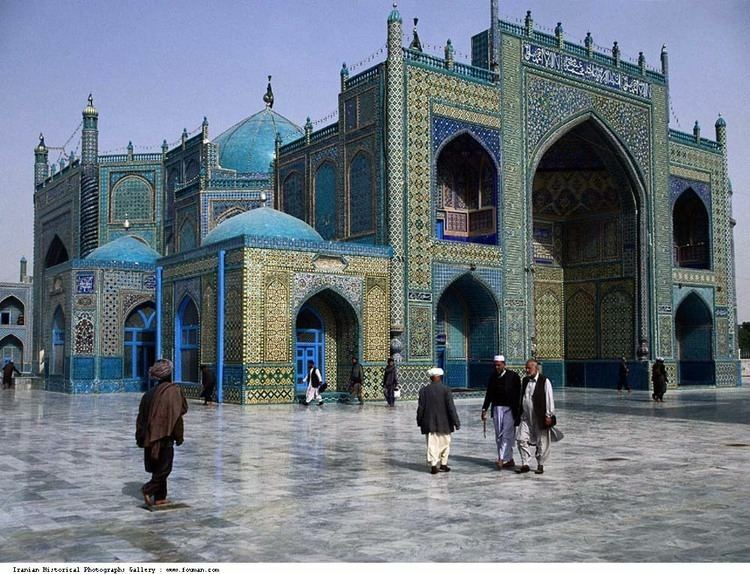 Mazar-i-Sharif serves as the major trading center in northern Afghanistan. The local economy is dominated by trade, agriculture and Karakul sheep farming. Small-scale oil and gas exploitation have also boosted the city's prospects. It is also the location of consulates of India and Pakistan for trading and political links. Mazar-i-Sharif Airport - serves the population of Balkh Province and is also used by NATO-led forces, including the Afghan Air Force. It is being expanded to become the 4th international airport in Afghanistan.